Dyslexia Champions (TM) training & accreditation programme. - Right Resources ....for a thriving and productive neurodiverse workforce. The DYSLEXIA CHAMPIONSTM training & accreditation programme is an initiative which has been designed to help organisations support neurodivergent individuals within the workplace - and by doing so they will be more likely to tap into the strengths many of these individuals are known to have. 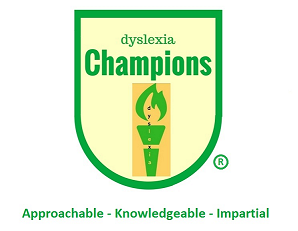 Accredited Dyslexia Champions are qualified & impartial volunteers who have completed their training equipping them to be able to listen to their colleagues 'stories' & challenges and provide them with much needed foundation information and 'hints & tips' as well as signposting them to professional support. (With this information they can then decide whether to seek professional support....or not). With this volunteer resource within workplaces it helps reduce fear of disclosure - which commonly stops people from seeking specialist workplace related support if / when they need it. The programme, which was developed by Janette Beetham - Senior Consultant to the British Dyslexia Association, was originally piloted at Imperial College London in January 2017 with excellent feedback on the training, which confirmed not only its value for neuro-divergent work colleagues but also that it contains modules which are Continuous Professional Development (CPD) essentials for everyone, such as wellbeing & mental health and active listening skills. The training programme, which covers 7 neurodivergent 'conditions', comprises of two full-day workshops plus 2 online/webinar modules - with an assignment/workbook which leads to an OCN (Open College Network) Level 2 qualification which is endorsed by the British Dyslexia Association. (There are also two 30 minute online mentoring sessions for each delegate during the short self-study element of the programme). You can choose from either the 'open' programme (where you will work with like-minded people from a cross-section of organisations) or employing organisations can have the workshop elements delivered 'in-house' which enables colleagues to work together and share scenarios from their own work environment etc. Thought provoking and eye opening. Exceeded my expectations and provided me with a lot of new information. The programme has been really great! It has given me confidence to talk about my processing differences and hopefully others will do so too. Very engaging, interesting & informative. It has increased my knowledge in the area and opened my eyes to simple changes that can make a big difference. Very positive but also quite emotional. I struggle to say what was the most useful part of the training as I found everything important. 'This was a fantastic course. It was really well structured and paced. The resources were excellent, in particular the on-line content was really useful. I learnt a huge amount and found the course insightful and relevant, both for my role as an educator and manager. I am an incredibly busy person and I think this course was very good use of my time'. Sara Rankin, ​Professor of Leukocyte and Stem Cell Biology, Imperial College London. For information on having the programme delivered within your organisation for your team or network please contact us and we can arrange a phone call to discuss your requirements and answer any questions you may have. Our next 'open' programme, takes place in London on 13th & 14th June 2019. ​Cost per delegate (inclusive of OCN registration) - £750.00 + VAT. (Please note: £250.00 per delegate goes to the British Dyslexia Association to support the valuable work this charity undertakes. Thank you). For an informal chat about the programme to explore whether this might be of interest to you please make contact us using our online form.